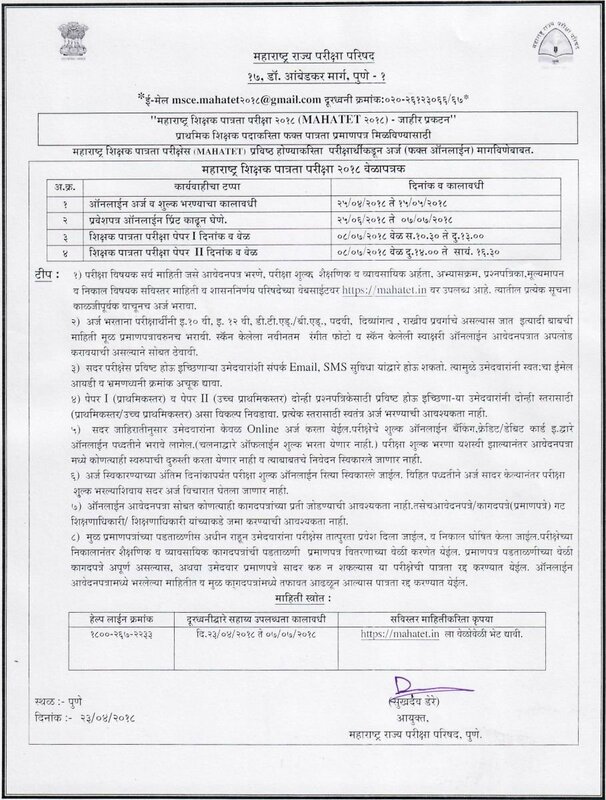 Education Department of Maharashtra has declare MAHA TET Application Form 2018. It is a Maharashtra Teacher Eligibility Test to provided admission on Lower Primary & Upper Primary Teacher vacancies.Applicants who are able to apply may download MAHA TET Notification 2018 from the official site @ mahatet.in.The online registration process will be start from 25.04.2018.Last date for submission of MAHA TET 2018 Online Form will be 15.05.2018.Candidates who will well register will appear in the Maharashtra TET Examination on 08th July 2018.To download MAHA TET 2018 Eligibility Criteria, Admit Card, Syllabus Details, read the details given here carefully. Check Maharashtra TET 2018 Eligibility Criteria : What is the Minimum Qualification & Age Limit For MAHA TET Online Form 2018 ? How to To Fill Up Maharashtra TET Application Form 2018 ? 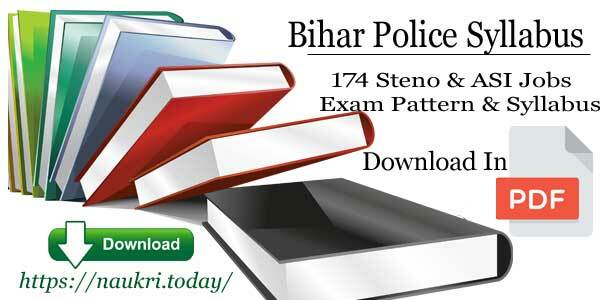 What is the Simple Steps Download MAHA TET Notification Pdf ? Interested participants may check MAHA TET Eligibility Criteria 2018 available here for Level I & Level II Teaching Jobs. It is necessary to satisfy the eligibility criteria otherwise the MAHA TET 2018 Online Form will get rejected. Hence you must carefully read and fill up eligibility criteria in the MAHA TET Application Form 2018. Applicant who wants to fill Maharashtra TET Application Form 2018 must have Qualification as given here. It is necessary to clear the 12th Standard with 60% marks from any identify education board. Read Paper I & Paper II qualification from Maha TET Application Form 2018 from here. MAHA TET 2018 Paper I Qualification : Candidates must have 12th Pass Certificate with 60% marks. Candidates must hold 02 year Diploma in Bachelor of Elementary Education. You may also apply with 02 year Diploma in Special Education/ 04 Year Bachelor of Elementary Education (B.Ed/B.E.I). Check MAHA TET 2018 Paper II Qualification : Qualified with 60% marks in the Graduation/ Passed or appearing in 04 Year B.Ed/ B.EI program. Participants having 02 year diploma in Elementary Education or 01 Year Special Education diploma can also apply. Candidates who wish to write Maharashtra TET Exam 2018 should not be less than 18 year old. The Maharashtra TET Exam Notification do not hold the upper age limit. Hence, applicants of any age can apply for MAHA Teacher Eligibility Test 2018. Candidates who wish to fill MAHA TET Application Form 2018 should check the application fees given here Paper wise. If participant wants to fill MAHA TET Online Form for single paper then registration fees will be different. But if applicants wants to apply for both papers then application fees will also be different. Hence, here we have shared paper wise registration fees for Maharashtra TET Application Form 2018. Paper I Fees : General applicants if wants to apply either for Paper I or Paper II then application fees will be Rs 500/-. For SC/ST/PWD candidates it will be Rs 250/- for single paper. On the next page you will get MAHA TET Application Form 2018 Link. Read the details properly via notification and then start filling MAHA TET Notification 2018. Also deposit the application fees and note down the transaction no. for Maharashtra TET Exam 2018. Now again check details then submit MAHA TET Online Form 2018. Direct link to check MAHA TET Application Form 2018 is available below. Conclusion : MAHA TET Application Form 2018 for the Level I & Level II Teaching Vacancies. 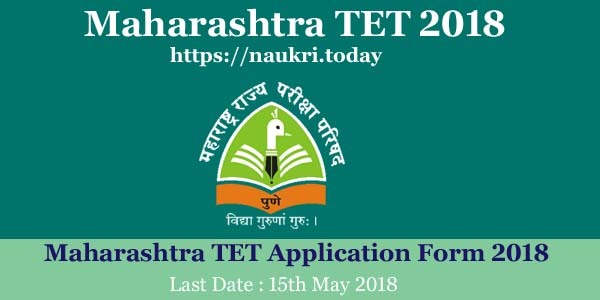 Candidates may submit their Maharashtra TET Online Form 2018 before the last date 15.05.2018. Maha TET Exam will held in the month of July 2018.